What a Weekend! Such a whirlwind of both nostalgia and excitement. 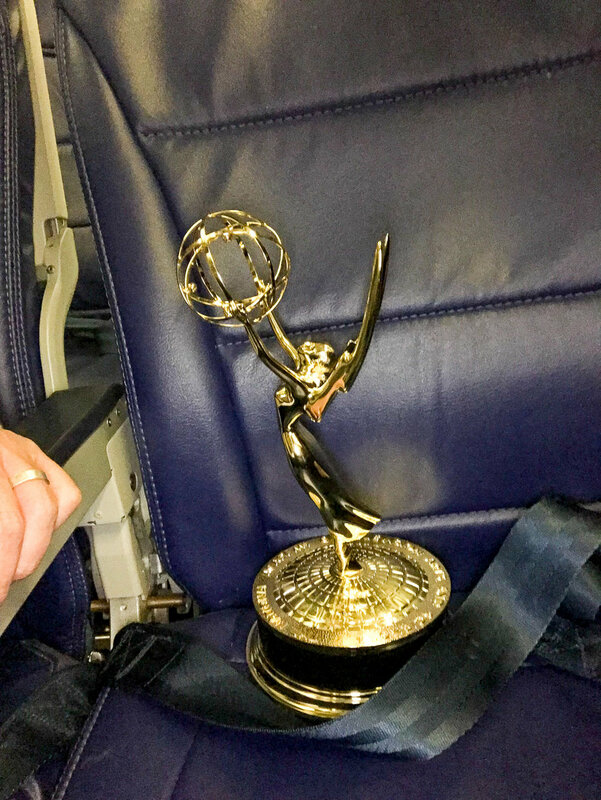 Any chance Abby and I get to go to Chicago is one we jump at, particularly one in which she is nominated for an Emmy (for her work on the WGN show Weekend Workbench). And guess what... She WON! We did win and I'm still riding the high! Even though we lost last year, I was still optimistic! After a stressful few days where Rent The Runway lost my dress in the mail and the mad dash to find another suitable for the event, I was so relieved and ecstatic when I heard them call our names. I'm a very anxious person and surprisingly right before our category I had such a sense of calm flood over me. It was just meant to be! 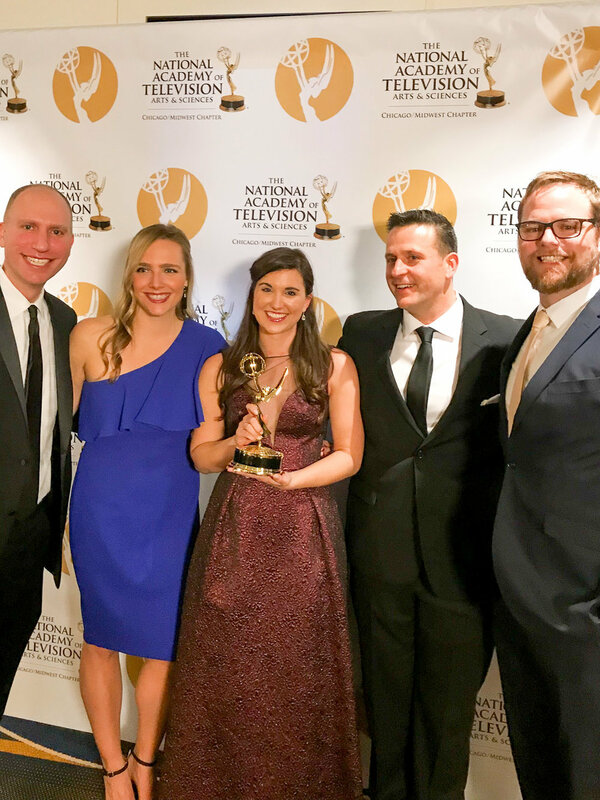 It's still crazy to think of myself as an "Emmy-winning Producer" and that will probably never sink in, but I'm so grateful that not only were we recognized for a show that I loved making and am proud of, but that our team is top notch and I just adore them! I am excited for all of us and while we no longer work together, we loved making that show so much. We flew in from North Carolina Friday night after work and headed straight into downtown. Obviously, at this point, all I'm thinking of is food food food. 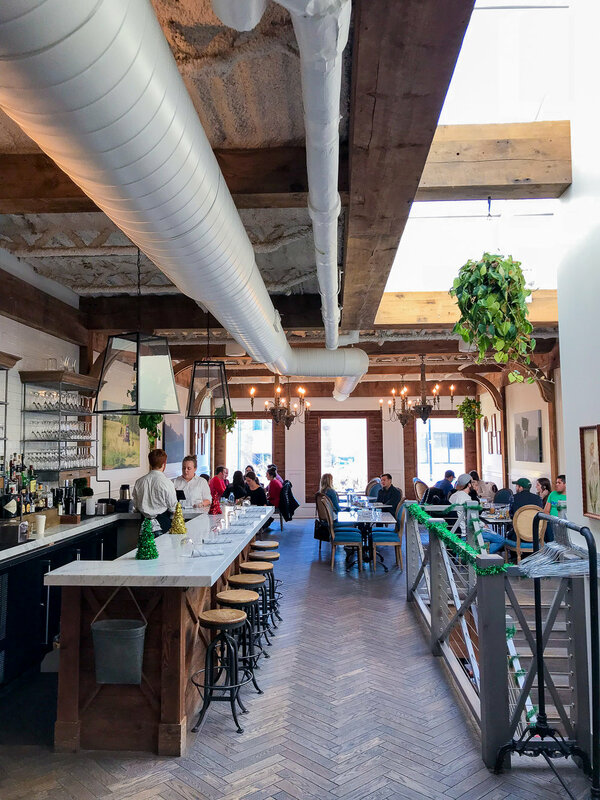 As hard as it is for us to deviate from our favorite and trusted go to places, we do try and check out at least one new place whenever we head back. And this time it was the Greek tapas restaurant Ēma. Solid cocktails and a great spicy hummus and burrata salad. I went with the pork shoulder and Abby got the tzatziki chicken. All very good! I loved Ema! It is now a new favorite of mine! Owned by the same people who run Summer House Santa Monica in Chicago (which we love too! ), everything was delicious and the interior decor is just so chic! After a solid 8 hours of sleep we got up and looked to get out and see the city in all its holiday splendor. 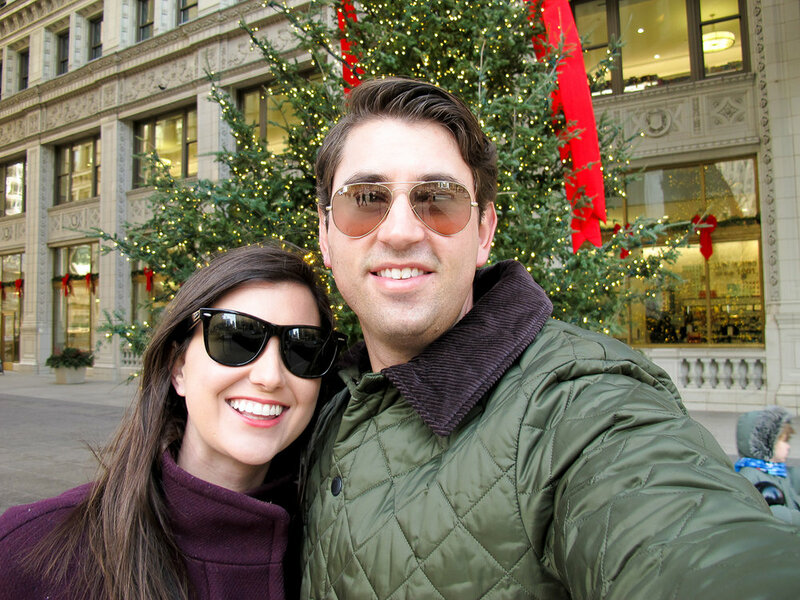 Chicago certainly does it right with christmas trees and lights around every corner. 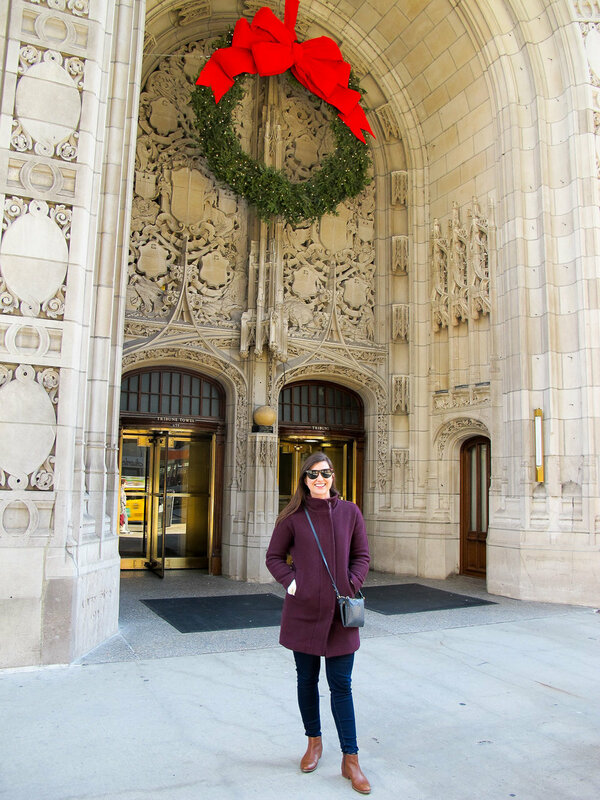 In front of my old office building- The Tribune Tower! Then it was off to breakfast with my mom and brother. 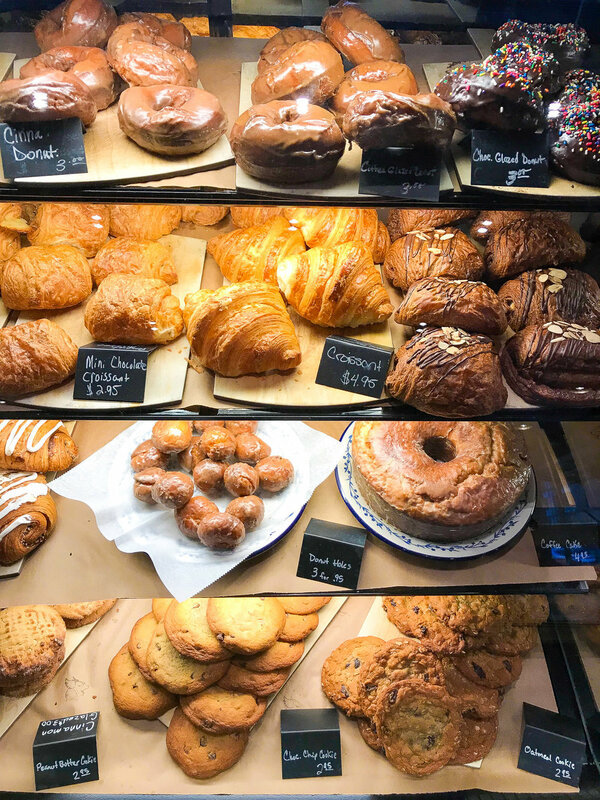 Cochon Volant was another new place for us and their pastry selection was off the charts. An the English Muffin cheeseburger was a unique spin as well. I went with the chocolate almond croissant. What a combo! 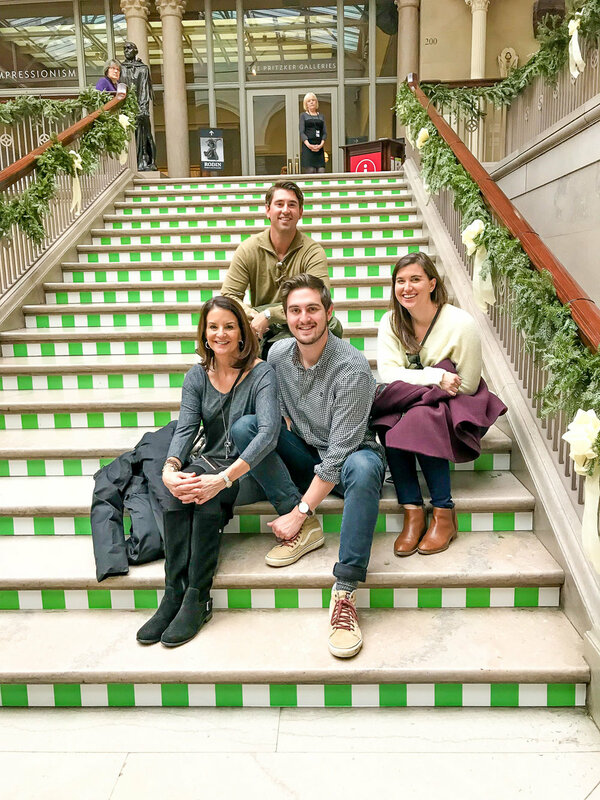 No trip to Chicago would be complete without a nice long stroll through the Art Institute. I still stand by the opinion that it's the best museum in the country. 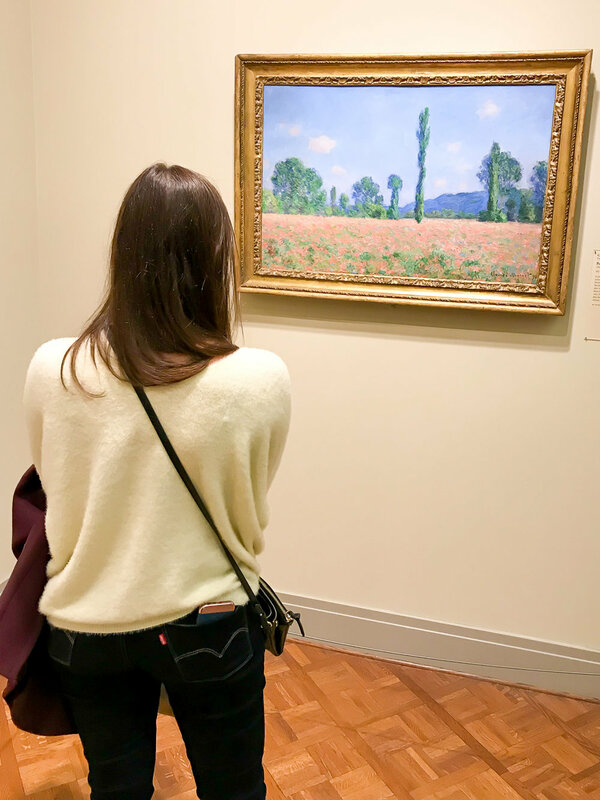 They had a special Rodin exhibit going on which was fantastic and we always swing by our other favorite pieces (holla Monet). 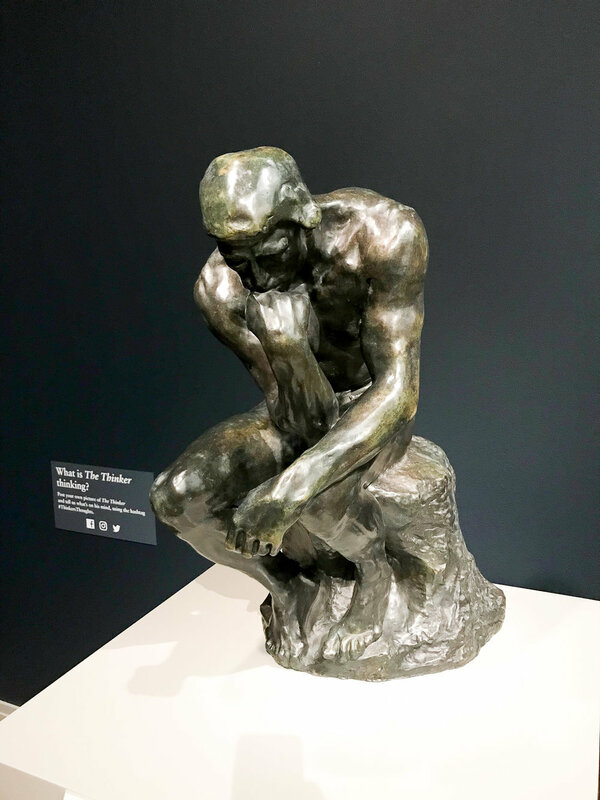 One of my favorites that I don't remember ever seeing was "God's Hand" by Rodin where he is molding Adam and Eve (see below). It was exceptionally beautiful and poignant. Post museum and after a quick afternoon jolt of caffeine at Sawada Coffee, it was time to get ready for the night. We were both so excited for the event and the chance to see some old friends. What a wonderful and memorable night. It is truly a bucket list item checked off for Abby. Now the only question is where to put our new golden friend (bookshelf, dresser, nightstand?). I'm deffintely trying to take some credit for this Emmy as I did drive Abby to the shooting location for the episode that won the Emmy. So it's practically OURS right? After a night of celebrating with many drinks and some late night pizza (also some live band karaoke) we got up and headed up to our old neighborhood of Lincoln Park. 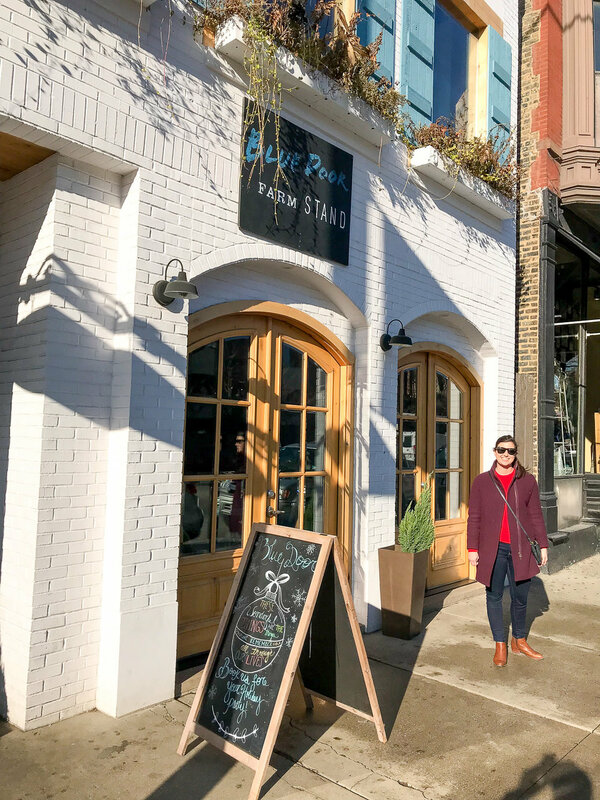 We had been dying to finally try out Blue Door Farm Stand, which was just a tiny soup and sandwich shop back when we lived in Chicago. The cheese curds are a must (you are in the Midwest remember)! Blue Door Farm Stand (there's also Blue Door Kitchen that is outstanding!) was so good and lived up to the hype. It's so nice to walk through your old neighborhood and see all the new houses and restaurants and shops and also how much is exactly the same! With our bellies completely full we dove right into what's become something of a tradition for Abby and me, walking up and down the three streets of our old neighborhood: Howe, Burling, and Orchard. These just might be the most magnificent streets in all of Chicago. The homes are massive and ornate, the landscaping is precise and it's so quiet for being in a big city. I don't know that we will ever love a street as much as we did Howe St. It's so perfect in every way. It's a dream of ours to move back to that street but into a house and not a tiny 600sqft apartment. Very doubtful we will ever be able to afford that, but one can dream! 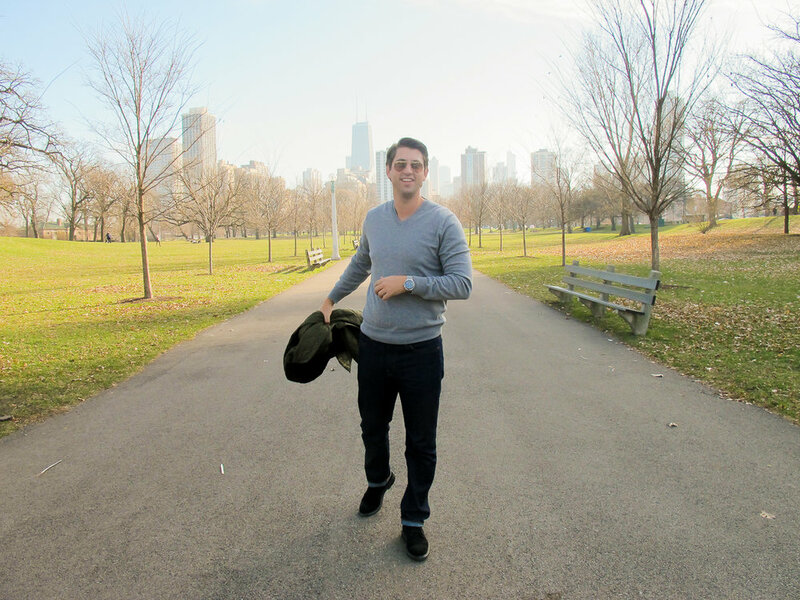 Before completing any Chicago trip, a stop by the lake is a must. With the Lakeshore Trail a fantastic walking path on a nice day, we headed straight there. Even if the sun is out in Chicago, a hot chocolate is never a bad idea. Cocoa & Co. has a great selection to choose from. A blast of a weekend for sure. Always too short in my view, whenever it comes to Chicago. Now we head back to North Carolina, Emmy buckled up and ready to go!